Have you ever thought about why so many freelance translators complain about an unstable flow of work? I believe that the reason is that many translators just don’t know how to find new clients (or help clients find you). I studied linguistics and translation theory at the university, but no one taught me how to sell services and position myself at the market. That was a great gap in our academic program. I’m scared to think about how many hours or even days I spent in vain bidding on various projects posted at translator’s job boards while I could have used this time more efficiently. The idea I recently found on CopyBlogger is not new, but it clearly describes the situation I stuck in two years ago when I got back to freelancing after leaving in-house technical translator position in a translation department of a local mining company. Well, when you start freelancing on the “rented land” you help digital sharecroppers to grow their business. Now I understand that I started from the wrong place. But two years ago no one told me I was going the wrong way. Therefore, one of the main purposes, why I started my blog about translation, is to share my freelance experience, provide clear and definite instructions on how to succeed as a freelance translator. Thus, you can avoid common mistakes I made on my way through the tight translation market. Today’s post is the first in a series of articles about personal website development. 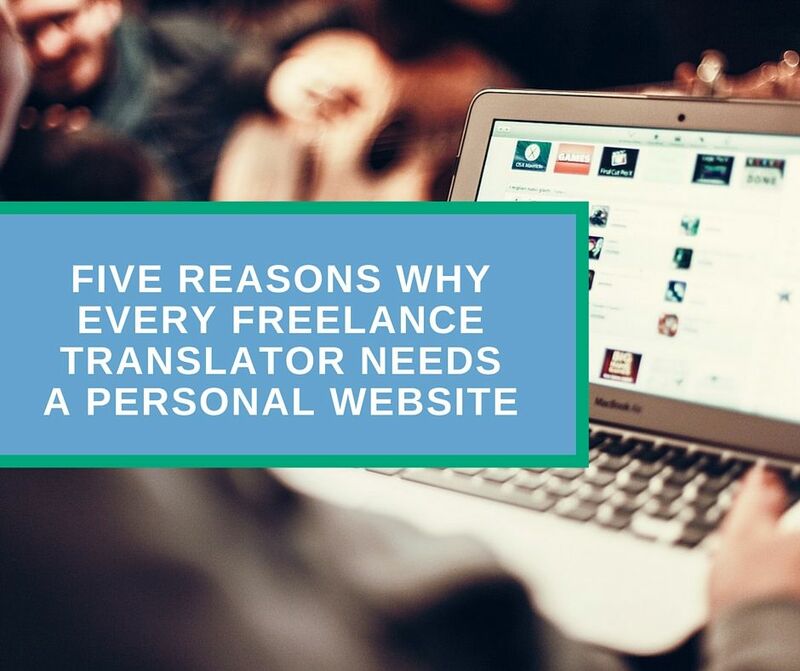 The series will focus on the creation of a personal website for freelance translation business. If you’re just starting your way in freelancing or working on a freelance basis for some time, you might wonder how to find more interesting, well-paid projects and high-end clients. Probably you have already registered at several job boards and started bidding. Well, translation job boards, of course, bring certain value. You shall register, fill in and maintain your profile updated just to start building your online presence. Job boards are also good for contacting with translation agencies. But according to my experience bidding on job boards is not the best way to find projects. Let me explain why. I don’t recommend to stop bidding at all. Just be more scrupulous. For instance, I’ve set up notifications from Proz and UpWork and send proposal only for those projects that fit my areas of specialization and payment expectations. Taking into account all the above, why don’t you invest your time into the development of your own website, where you are almost unlimited to promote your services? All the more you can create a professionally looking website even without programming skills! Let’s finally get to the main reasons why you should create your website. Why every freelance translator needs a personal website? In the first instance, comparing job boards and personal website I can give the following example: translation job board is like a shopping mall where your account is a small boutique. In this case if you use a free account, your “boutique” is located on the last floor (and It’s not a penthouse). If you have paid account, your “boutique” is somewhere between the similar old-fashioned boutiques and you still have no guarantee that you will get clients. In addition, you will still need to spend your time and money for the promotion of your profile, either through link building or through advertising. But all your efforts will add SEO value not just for your account, but for the “rented land” (job board site in this case). Oh, I forgot to mention that you are prohibited to change the outfit and layout of your “boutique”. The same outdated design almost unchanged since 2005. 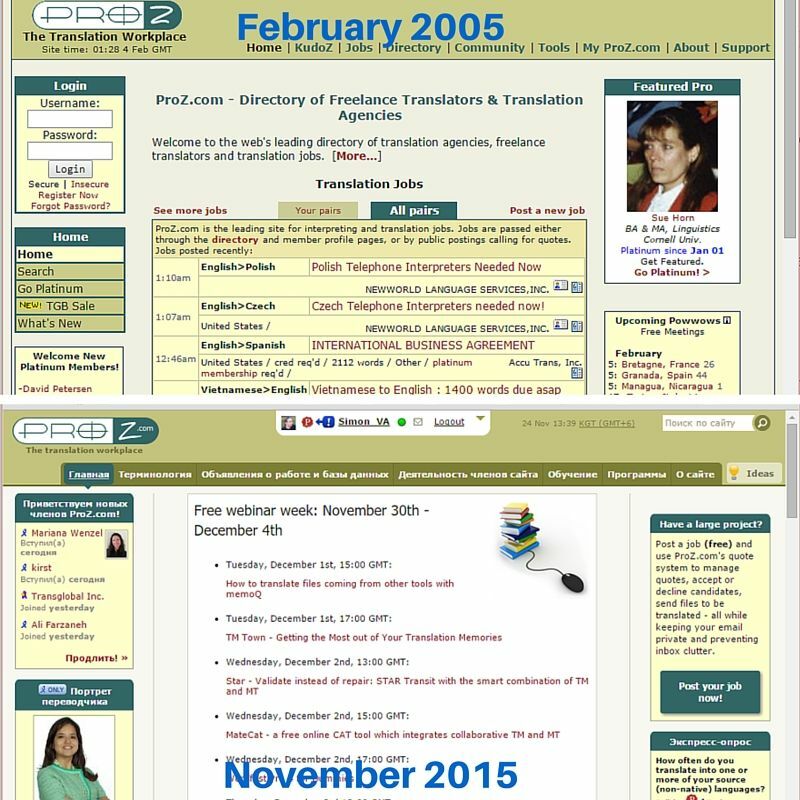 Just take a look at these screenshots of Proz.com in 2005 and today. Many other translation job boards, like Translator’s Café and Translation Directory, are no exception. On the other hand, you may invest your time and the same amount of money to create your professional website, where you can take an advantage of marketing methods and techniques, like email and content marketing, for better customer acquisition, as well as to represent yourself in the most impressive way. For your information, Proz yearly membership costs $133, while you can buy an awesome WordPress premium theme designed by professional developers at ThemeForest, and a year of hosting from HostGator with one-click WordPress installation for about $130-140 in total. In other words, it will be your full-fledged “shop”. Well, I don’t say it will be easier to get first clients and turn them into recurring customers, but building and promoting your personal website means that you have a unique business with a brand name that will finally bring you even more high-end clients in comparison to job boards. Professional website significantly improves your business credibility and visibility on the web. As the owner of a professionally designed, modern-looking, and informative website you will stand out at the background of those freelancers, who don’t have one. Running a website shows that you are a responsible person ready to contribute time and invest money in your online business. You’re a person who knows that freelance earning is not a fable but a real perspective. Thanks to various plugins and themes, you can create and place your personal portfolio with online resume on your website. And you can make it look exactly the way you like it almost without any limitations! In addition, the website will become the main tool for promoting your translation services on the web. Your personal website will be a benchmark of the marketing strategy. Here you can connect with your potential clients, receive their feedback, run your personal blog or podcast, offer discounts and many other awesome things. You may place almost anything on the personal WordPress-based website, from articles and galleries to videos and embedded content like tweets, PDFs, Instagram photos, etc. You may also integrate a web chat and a shop. Imagination is your only limit. There are so many useful, beautiful and free plugins in WordPress repository that you can build almost anything you want even if you don’t have programming skills. I always wanted to find such hobby that would not only make me happy but bring me some money as well. I started to learn web development about two years ago and this exciting process entirely captured my attention. When I got first results from my first website (not this one) I was insanely happy. I saw how hours of work finally turned into revenue. My efforts bring not one-time jobs but a relatively stable flow of projects. And the more I work on my website the more I earn. In conclusion, I would like to note that website will unleash new opportunities for your personal and business development. Creating your personal website is not as difficult as you might think. Don’t be afraid to do something new! Ask questions about website development for freelance business or leave your comments below. I will be more than glad to help you. And don’t forget to signup for my newsletter to be notified on weekly updates!